At the Council meeting on 4 February 2019, Newry, Mourne and Down District Council agreed its budget for the next financial year (from the 1 April 2019 to 31 March 2020). The 1.99% increase in the District Rate will cover the costs of those public services the Council is responsible for, including the economic regeneration of the district, planning, provision of leisure and community facilities, and refuse collection and street cleansing. The Rates that residents of the district pay are made-up of the District Rate (which is agreed by the Council) and the Regional Rate (which is usually agreed by the Northern Ireland Executive). This money, along with the block grant that Northern Ireland receives from Westminster, is used to pay for public services. Two sets of rates have been agreed as part of the District Rate: the Domestic Rate (for householders) and the Non-Domestic Rate (for businesses). The Domestic Rate for 2019/2020 will be 0.3893 pence (2018/2019 equivalent 0.3817 pence). For a property valued at £100,000, the annual increase of the District Rate for 2019/20 will be £7.60 or 63.3 pence per month. A 1.99% increase means the Non Domestic District Rate for 2019/2020 will be 24.2403 pence (2018/2019, equivalent 23.7668 pence). 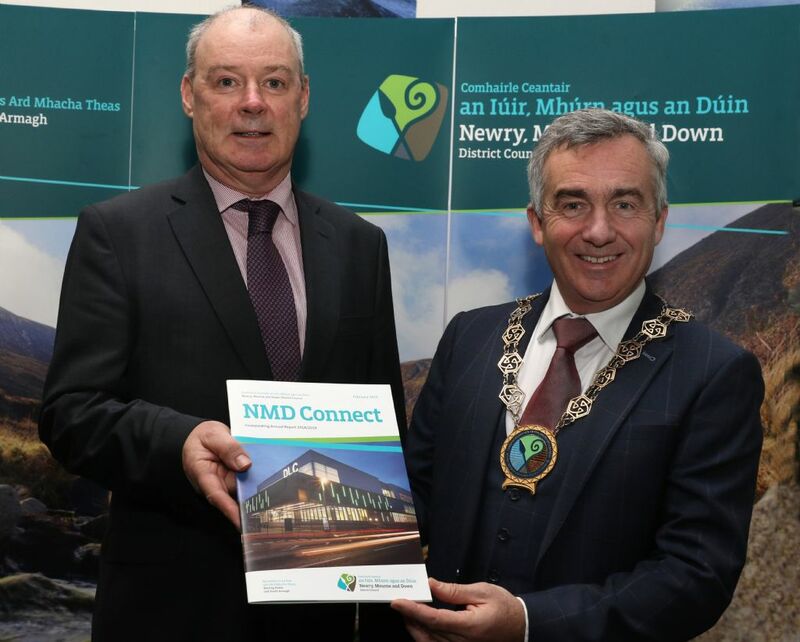 Chairman of Newry, Mourne and Down District Council, Councillor Mark Murnin said, “One of the Council’s most important responsibilities is to set a rate that enables it to fulfil our commitments to all our citizens. At the same time, it is important that we take into account the challenging economic circumstances that our ratepayers, both domestic and non-domestic, are experiencing, particularly in respect of the uncertainty surrounding Brexit. “We believe that the Council has set a realistic rate for 2019/20, one that will allow us to continue to improve the economic prosperity of our area, meet the challenges of the coming year and improve the health and wellbeing of all our citizens—as well as ensuring the delivery of the high-quality services our residents require and expect. “We are very proud of our record of providing funding to our many community groups which deliver projects on the ground throughout our district. Over the 2018/19 year, some 491 community groups and their schemes have benefited from funding of £1,561,985 and we expect to deliver ongoing support throughout 2019/20. Chief Executive of the Council, Liam Hannaway added, “During the 2018/19 financial year, our Council has continued to deliver on both the services and key projects that were agreed in our 2015-2019 Corporate Plan. We have continued to improve our recycling rates, both for blue and brown bin collections, reducing the amount of waste going to landfill by 60%. “This year we were pleased to open the new state-of-the-art £15.5 million Down Leisure Centre, a signature project that will make a real contribution to improving our citizens’ health and wellbeing. We are even more ambitious for the coming year; with the agreement on funding for the Belfast Region City Deal, we have plans for a new conference and theatre facility in Newry City, the delivery of the Southern Relief Road and a 10-year programme of economic growth. “The reopening of the Warrenpoint Municipal Park in August and the opening of the Carlingford Lough Greenway from Newry to Victoria Lock in July demonstrate our Council’s commitment to improving our area’s attractions and environment. In the coming year Newry and its Cathedral Corridor will see £100,000 for improvements, festive lighting and events, building on what we have already achieved. Some of the projects that will be progressed during the 2019/20 year include further revitalisation of Warrenpoint, with £150,000 for town improvements, including shop fronts, new signage and a promotional and marketing campaign. The Council has also secured approval for the Ballynahinch Bypass, a plan that will greatly improve access throughout the area and relieve the traffic congestion in the town centre. Plans for the Southern Relief Road in Newry will be progressed now that the preferred route was announced in October 2018. Developing the strategic link road between the A1 Dublin Road and the A2 Warrenpoint Road, a project that the Council is working on with the Department, will contribute to increasing the economy of the whole region. The plan will now move to the next stage, with the Department for Infrastructure developing the design of the road and preparing an environmental impact assessment for public consultation. Improving public services, and the way they are implemented is an important goal for the Council. For 2019/20 the Council has five ambitious performance improvement objectives including to encourage healthy lifestyles, improving economic growth and promoting the district as a premier tourist destination, delivering urban and rural regeneration initiatives, creating a cleaner, greener district, and encouraging and empowering local communities to work with the Council to deliver on its programmes. Over the coming months, the Council will be working with local groups to ensure that their views on how best to implement these important goals. Over the coming year, the historic town of Downpatrick will benefit from a new public realm improvement scheme as part of the Masterplan, which will be delivered in partnership with the Department for Communities and the Department for Infrastructure. The district continues to benefit from EU funding with £2.3 million being provided to South East Area Fisheries Local Action Group (SEAFLAG) which promotes economic growth and job creation in coastal and inland communities. Under the PEACE IV programme £4.7 million has been allocated to the Council to deliver the Local Authority Action Plan—Beyond Tolerance in the three key areas of children and young people, shared spaces and services, and building positive relationships. Projects funded under this initiative include an archaeological dig near Down Cathedral which will help provide more information on the legacy of St Patrick, and a cross-community choir aimed at establishing and developing new relationships. Printed copies of the magazine are also available in the Council's public buildings or a copy can be posted to homes within the district upon request. An Irish language version will be published online and other formats can be made available upon request by emailing: marketing@nmandd.org or by telephoning 028 4461 0841.